We are not all lucky to live in a big and luxury apartments. If you belong to this group, don’t worry! 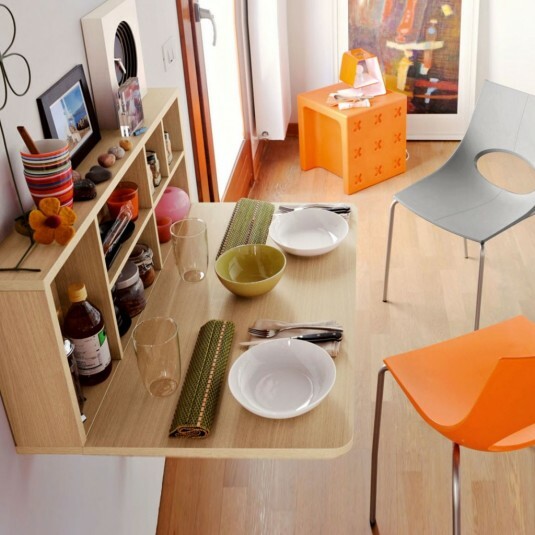 Although your apartment may be small, there are a lot of solutions that can make it look big and functional, we will present you in this post space saving dining tables. Yesterday, I made a huge research and I concluded that there are a lot of space saving furniture designs that can help us organize our apartments in a clever way. 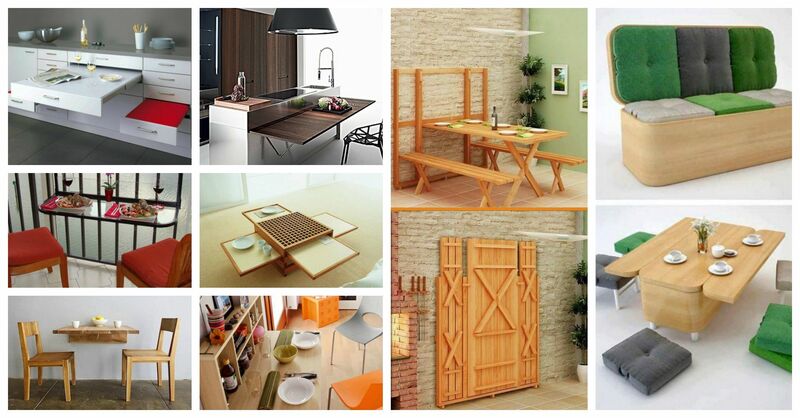 So, my post for today is called “Top 10 Space Saving Dining Tables”. These table designs will show you how to organize your apartment even when you don’t have a dinning room. That’s mean that they are not requiring a large space and you can enjoy your meals every day on a dining table like the other people. If your space is really small and you don’t have so much space, you can think of buying multi-functional furniture, like the one below. This lovely sofa is perfect for watching tv, reading books, etc. When you are hungry and want to eat, you can use the other function of this furniture and make it look as a luxurious dining table for six people. If you have a romantic soul and you love spending time with your lover, you can think about the solution below. 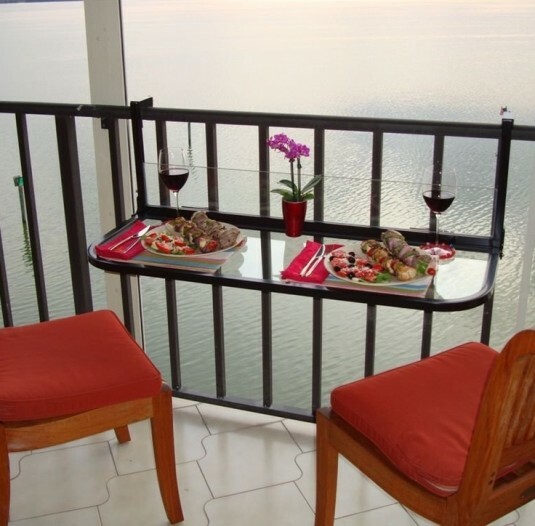 This table can be added to almost every balcony. But, I need to say that the weather plays a really important role here. In other words, you can’t have your meal when is cold outside. Some of the space saving dining tables can be folded, that’s mean that you don’t need to worry about the width of the table and the place you need for that table. You just need to unfold it when it’s time for a meal and fold it when you finish. 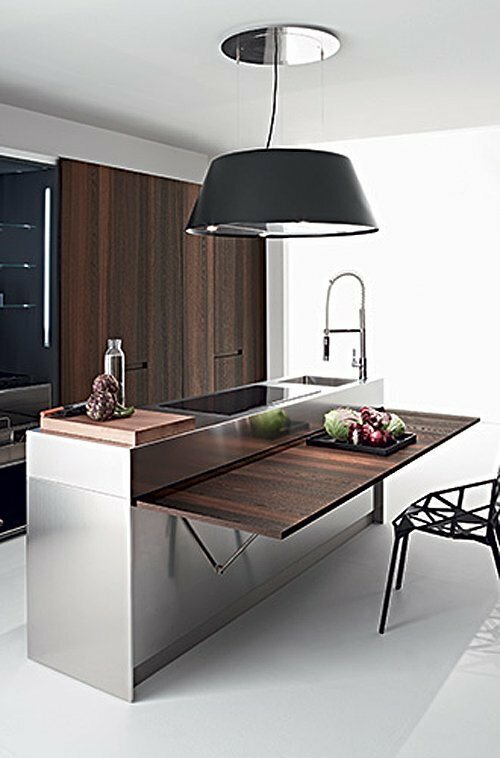 If you are dreaming of a kitchen island, but you have a tiny kitchen and there isn’t a possibility of placing a big one, don’t worry. The solution below is perfect for you. You can use this place for both, cooking and eating. Plus, it can be folded when you don’t need. This luxurious space saving dining table below won’t take you a lot of space. 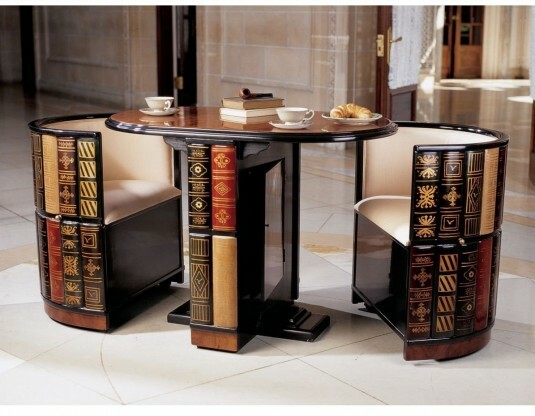 Plus, it looks very nice and comfortable for having your meals. It has one disadvantage – it’s made for two people and only two people can use it at a time. You don’t have place for a dinning table, but you probably have for a shelves in the living room. 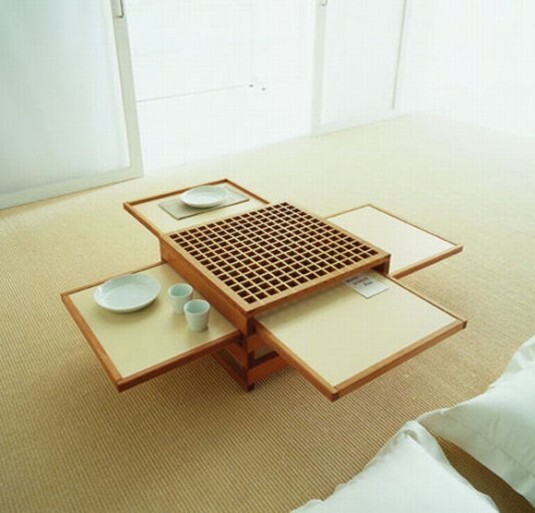 Did you know that the pull outs can be used as a dining table? This solution is my favorite and in my opinion the smartest one. This one is similar to the previous one. The difference is that you will need chairs for this one here, while for the previous one you will need pillows or you can sit on the ground. 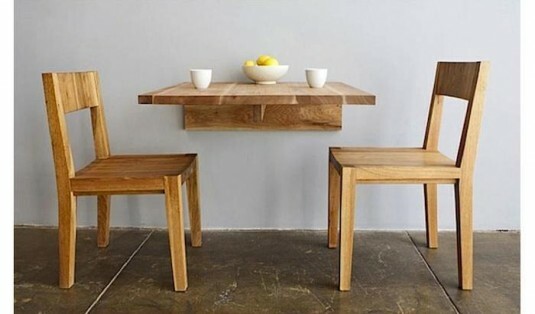 Wall mounted table is also an interesting idea, perfect for every tiny apartment. 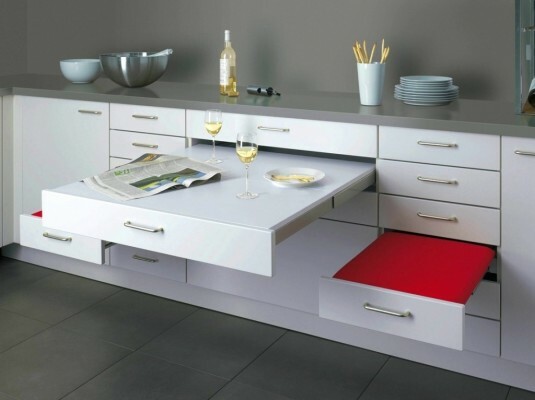 It doesn’t require a lot of space, plus it offers you a comfort and you can enjoy your meals with your partner. 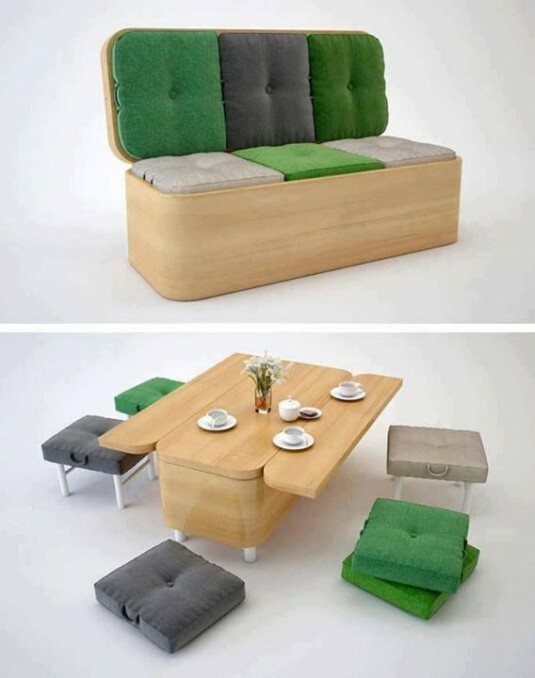 Luxurious and comfortable idea, perfect for every tiny apartment. This dining table looks very sophisticated and modern. Plus, it docent require a lot of space. If you enjoy having your meals with your family, then this is a perfect solution for your apartment. If you have only space for a coffee table, then you should think twice before choosing one. I have a perfect solution for you. This multi-functional amazing coffee table is perfect for every small apartment and you can enjoy your coffees and meals every day. Did you like these space saving dining tables above? If you have some other interesting solutions, let us know.